The scientific consultants listed below provide expertise in multiple disciplines; analytical techniques available include optical microscopy, scanning electron microscopy/electron dispersive spectroscopy (SEM/EDS), infrared spectroscopy (IR), nuclear magnetic resonance (NMR), mass spectroscopy (MS), gas chromatography (GC), and X-ray diffraction (XRD). Several other sophisticated definitive techniques are also available, if the situation warrants these. Previous professional positions include: Project Chief, Minerals-Water Reactions Project (1981-2011) at the U.S. Geological Survey (USGS) in Boulder, Colorado; Assistant and then Associate Professor, Geology (l975-l981), University of Illinois at Urbana-Champaign; Assistant Professor, Geology (1974-l975), Northern Illinois University. Memberships in Professional Societies include President (1993) of the Clay Minerals Society; member, Mineralogical Society of America; Councilor, Assoc. International pour l'etude ds Argilles, and others. Dr. Eberl has also rendered scientific judgement as Associate Editor of multiple scientific publications, including Geologica Carpathicas, Clays (1992-2000), Applied Clay Science (1984-2000), Clays & Clay Minerals (1978-1986), the J. Sedimentary Petrology (1978-1981), and written reviews for the NSF, Geology, Science, American Mineralogist, etc. He has also held various Visiting Professorships, including Visiting geochemist at Caltech (Spring, 2000), and holds several patents. He was the Brindley lecturer for The Clay Minerals Society (1993) and is author or co-author of well over 100 papers published in mainstream peer-reviewed science journals. Professional Memberships include: Huron County Soil & Crop Improvement Association, Canadian Phytopathological Society, American Phytopathological Society, American Society of Agronomy, Agricultural Institute of Canada. Owner, Agri-Solve Inc. & Erb Crop Management Systems Inc. (http://www.agri-solve.ca), Mr. Erb is an independent certified professional crop consultant providing comprehensive nutrient management planning, integrated pest management & full- service production advice on corn, soybeans, white beans, kidney beans, wheat, canola, small grains, mustard, forages & cover crops. Dr. Greub has published multiple refereed papers in Crop Science, Agronomy Journal, The Journal of Production Agriculture etc. 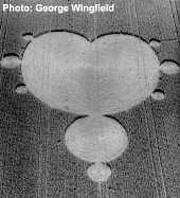 & is one of the primary authors of the textbook "Crop Production", along with R.J. Delorit and H.L. Ahigren (Prentice Hall). Dr. Greub held the post of Professor of Agronomy at the Univ. of Wisconsin-River Falls from 1968-1999. Since 2000 his title is Emeritus Professor of Agronomy, Plant & Earth Science Dept., University of Wisconsin- River Falls. He has been interested in the circle phenomenon since they first began to be reported in the 1970s and has traveled to England to investigate them first-hand. Consultant and Summer Employee, Lawrence Livermore National Laboratory,1975-1992, specializing in electromagnetic theory, EMP, microwave radiation, electron beams. Worked on the Star Wars Defense System. on the surface of the sun. Observatories; Scientific Director, 60" Telescope Program, Smithsonian Astrophysical Observatory; Lecturer , Harvard University. In addition to teaching both graduate and undergraduate courses in reliability, unsteady aerodynamics, random vibrations, aeroelasticity and structural dynamics since 1963, Professor Stearman has worked with the Boeing Co. as an Aerodynamist and as a Senior Analyst in the Mathematics and Physics Division of the Midwest Research Institute. His consulting experience includes work for the Air Force and several D.O.D.-funded programs at wind tunnel research facilities at NASA Ames and NASA Langley and at Air Force-owned AEDC facilities. Most of this work involved research on aeroelastic-related phenomena. Dr. Stearman has published multiple papers in refereed journals and is an active member of several professional societies, including the AIAA, ASA, SAE, ASEE and the EAA. Currently: Bettie Margaret Smith Professor of Engineering, Aerospace Engineering and Engineering Mechanics Dept., University of Texas at Austin. John Burke, our friend and fellow explorer, and one of the three original members of the BLT Research Team, has died. He will be missed, but his contributions remain. 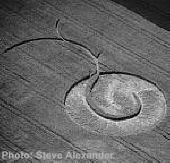 "Lefty" Levengood, the Michigan biophysicist whose pioneering research into the causative energies which create crop circles, and one of the three original members of the BLT Research Team, has died. He leaves us with a stronger foundation upon which to build an expanded understanding of "reality." Since1984 has worked in fields of engineering technology, vacuum technology, thin films and high-temperature semiconductor chemistry. Also works on research projects in association with the McMaster Foundation for Gravity Research. Nick worked in the capacity of scientist at First Solar LLC in Toledo until his death in 2013. Dr. Reynold's was Frederick Hall Professor of Geology and Mineralogy, Emeritus, Dartmouth College, until his death in December, 2004 and was a world-recognized expert in X-ray diffraction analysis of finely-dispersed layer compounds and, particularly, of clay minerals. Dr. Roll was Adjunct Professor of Parapsychology State University of West Georgia, until his death in January, 2012.